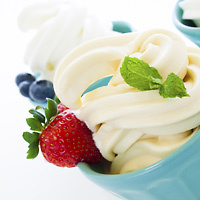 Sweets aren't off-limits in the Mayo Clinic Diet. Here's how you can have your cake and eat it too. Sweets like cake, cookies, candy and doughnuts are loaded with "empty calories" — mostly from sugar and fat — because they are not very filling and offer very little (if any) nutritional value. But don't worry, you don't have to give up these foods entirely. Just be smart about your choices and portion sizes and pay attention to all the grams of sugar you are consuming in your cereal, coffee and other beverages. It adds up! The Mayo Clinic Diet recommends limiting sweets to 75 calories a day. You can have your daily allowance or save up those calories for a special occasion, like a slice of birthday cake or a treat at the movies. Small amounts of dark chocolate or low-fat frozen yogurt are good choices for satisfying a sweet tooth, and you can also opt for other treats with some nutritional value, such as fresh fruit or smoothies. In a blender, combine frozen strawberries, banana, soy milk and frozen yogurt. Blend until smooth. Pour into tall, frosty glasses and garnish each with fresh strawberry slices. *Note – all sugar in this recipe is natural; there is no added sugar. Over time, you just may start preferring healthier sweets over high-calorie, packaged goods. Don't assume you need a decadent dessert to satisfy a craving!